This lesson plan will cover Japanese Art before 1392, from the Prehistoric to the Kamakura period. A recurring theme in the history of Japanese art and culture is the constant flow of influence from China and its transformation into a unique Japanese form. Thus, often following the lessons on South Asian, Chinese, and Korean art, this lecture can provide great opportunities for students to develop skills in comparative analysis, through which they gain critical assessment of pan-Asian internationalism vs. Japanese local/national style. While Buddhism, spread through the Silk Road, is the most important vehicle for cross-cultural exchanges at this stage in history, comparison to Chinese artifacts, such as ancient pottery and medieval scroll painting, can also be effective. Nobuo Tsuji, the art historian who authored the most recent survey of Japanese art history (Nihon bijutsu no rekishi, 2005; no English trans. ), identifies the tendencies towards “decorativeness,” “playfulness,” and “animism” (including a secular interest in “animating” inanimate things) as three crucial features of Japanese aesthetics. Perhaps, instead of lecturing on such a preset of ideas, ask students to contemplate on what they detect as distinctive qualities of Japanese art for themselves. Another theme in this lecture is the urge for imagination, animation, and storytelling in visual art. These concepts can perhaps relate to many of your students’ prior knowledge on Japanese art and culture, predominantly derived form manga comics, animé, and video games. Since these Japanese pop-cultural products frequently draw visual and narrative motifs from art and literature of the past, ranging from ancient to modern times, one possible opening exercise could be a formal analysis of Goggle-Eyed Dogū—a motif often adapted to monster/alien/enemy characters in recent Japanese visual culture. Once students conclude that it is a representation of a woman, comparable to, but with very different emphasis from, the Woman of Willendorf, you can then ask students why they think contemporary creators almost unanimously focus on the “monstrous” quality of this figure, disregarding its feminine identity, and why this prehistoric design, highly stylized and full of creativity, seems to perfectly fit visual fictions of our time. The tendency towards stylization/abstraction and imagination can be related to the interest in simplified or humorous forms and the various storytelling techniques explored in this lecture. Goggle-Eyed Dogū, excavated from the Tsurugaoka site, Aomori prefecture, 1000–400 BCE, Jōmon period, 36.7 cm, earthenware. In addition to textbooks, for in-depth discussions of historical contexts and individual objects, you can consult specialized surveys such as History of Far Eastern Art by Sherman E. Lee (covering South, Southeast, and East Asia); History of Japanese Art by Penelope Manson (most extensive on Japanese art); Discovering the Arts of Japan: A Historical Overview by Tsuneko Sadao and Stephanie Wada (concise and well-organized). Among the web sources, the Metropolitan Museum of Art’s Heilbrunn Timeline of Art History and Freer-Sackler’s Teacher Resources on Arts of Japan are particularly useful. On Buddhism, you can refer to Minneapolis Institute of Arts’s, The Art of Asia: Buddhism, for an abridged overview, and USC Pacific Art Museum’s Visions of Enlightenment is a great interactive program, helpful for students’ own exploration of Buddhist concepts and regional visual traditions in Asia. The most accessible way to understand the essence of Shintōism and Shintō gods, both for instructors and students, is to watch Hayao Miyazaki’s feature animation Spirited Away, briefly analyzed in this essay. 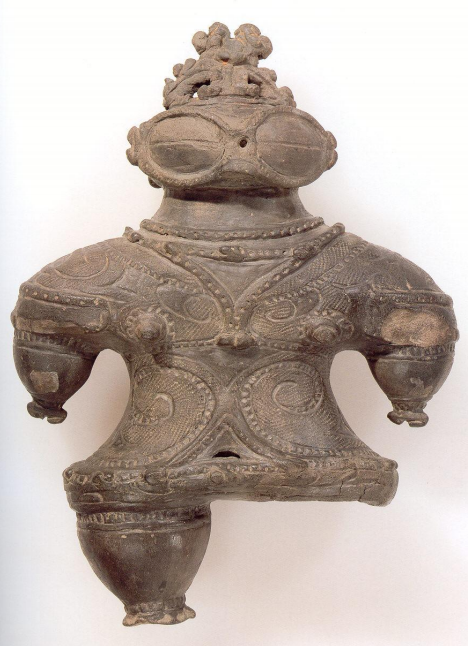 Dogū (“clay icon”): an earthenware figurine possibly created for ritual purposes during the Jōmon period. Emaki or emakimono: illustrated narrative scroll that developed from handscroll painting imported from China into a unique pictorial narrative during the Heian and Kamakura period. Haniwa (“clay circle”): clay sculpture representing human figures, animals and buildings that were used to adorn the kofun. Heian-kyō (Kyoto): Japan’s second capital, built in 794 CE. Heijō-kyō (Nara): Japan’s oldest capital, established in 710 CE. Jōmon (“cord marking”): the decorative pattern found on prehistoric ceramic objects, created by pressing a cord or rope against unfired clay; the term also refers to the historical period when this style of pottery was produced. Kana or hiragana: the phonographic writing system, developed from abstracted Chinese characters; initially recognized as on’na-de (feminine style/women’s hand writing) as opposed to otoko-de (masculine style/men’s hand writing) of Chinese characters. Kofun (“old mound tomb”): large scale burial mounds, erected as the tombs of rulers and community leaders during the Kofun period. Mahāyāna Buddhism: the school of Buddhism that became spread to Japan and other regions of East Asia. Literary meaning “great vehicles,” Mahāyāna aims for the salvation of a communal whole, in contrast to Theravāda Buddhism, practiced in Sri Lanka and most of Southeast Asia, that focuses on one’s individual path to enlightenment. Mudra: the hand gesture of Buddhist figures that have symbolic meanings. On’na-e: feminine style/women’s hand painting characterized by sumptuous rich colors. Otoko-e: masculine style/men’s hand painting, initially typified by ink monochrome style informed by Chinese painting but later associated with the depiction of dynamic movement or military subject. Pagoda: a Buddhist reliquary in the form of a tower-like structure; the tall, slender design originated in Han dynasty China, replacing the dome-shaped stupa reliquary developed in India. Shintō (“the way of gods”): indigenous religion of Japan that worships yaoyorozu no kami (Eight Million Gods), various gods and spirits of nature and inanimate objects. Japanese emperors are believed to be the descendants of the one of the supreme deities, the sun goddess Amaterasu. After the arrival of Buddhism to Japan, the elements of the two belief systems were often fused and simultaneously venerated by many Japanese. Torii gate: a gateway to Shintō shrine. Yamato: ancient name of Japan. Yamato-e: literary “Japanese painting,” but used to refer to a painting that depicts local landscape or a domestic subject, in contrast to Chinese-influenced kara-e (“Chinese paining”). The Jōmon period (c. 11,000–c. 300 BCE) covers a wide range of time when semi-sedentary hunter-gatherers developed Meso/Neolithic culture on the Japanese archipelago. As Jōmon (“cord marking”) refers to the characteristic surface patterns found on numerous clay shards, the invention of pottery making was the hallmark of this culture. Recent scientific research dates some Jōmon clay pots prior to 10,000 BCE, making them the oldest known ceramic objects in history. In the Middle to Late Jōmon phase, clay vessels were profusely decorated with coiled motifs, the most elaborate ones possibly used in rituals. Also widely produced in this period are clay figurines known as dogū (“clay icon”), mysterious humanoids that exhibit high degree of creativity. Goggle-Eyed Dogū represents the type of dogū frequently excavated in the northeast region, characterized by the exaggerated, coffee bean shaped eyes (“goggle-eyed” because they resemble the snow goggles traditionally worn by the Intuits, but there is no actual cultural/historical connection). While highly stylized and disproportionate, the figure’s pointed breasts, small waist and wide hips unmistakably point to her female identity. The incised lines, cord marking patterns, and series of dots that cover her torso may represent tattoos, and the protrusion on her head could be a headdress or intricate hairstyle. Although the true meaning and function of dogūs remain unknown to us, the goggle-eyed type possibly personified fertility, and since several examples have been discovered with one leg broken, some archaeologists suggest their usage in healing rituals. The distinctive artistic aesthetic of the Yayoi people is most obvious in their earthenware vessels such as Storage Jar, which displays a striking contrast to the dynamic decoration and imagination of Jōmon potteries. In contrast to the open fired and thickly coiled Jōmon vessels, Yayoi potteries are thinner, more durable, and symmetric in shape thanks to the introduction of kilns and potter’s wheels. Their pottery also completely lacks or only contains simple, minimal decorations. In the subsequent Kofun period (c. 250–538/552 CE), the Jōmon tendency towards bold creativity and the Yayoi taste for simple elegance seem to have been fused in the production of haniwa (“clay circle”) figurines, a kind of funerary object that adorned the exterior of kofun (“old mound tomb”) tumuli. Between the mid-third and early sixth century, about 160,000 kofun tombs of various shapes and sizes were built as burial mounds for community leaders, the most enormous of which is the key-hole shaped Tomb of Emperor Nintoku in Sakai city, Osaka. A variety of haniwa—representing men, women, animals, houses and boats—were placed on the top of kofun along the edges, supposedly in order to define the boundary between the worlds of life and death or to guard the deceased in the burial chamber below. Consisting of hollow coiled cylinders with incised holes and lines indicating eyes and mouths, human and animal haniwa are simple in construction, but bluntly communicate unpretentious emotion through their facial expressions and humorous gestures. Haniwa Warrior is one of the most intricate designs created in the late Kofun period, providing detailed visual information of ancient Japan’s arms and armor. A comparison with the terracotta soldiers from the tomb of Qin Shihuandi could be a good topic for class discussion, highlighting the contrast between the Chinese interest in realism as the expression of military power, and the Japanese emphasis on emotional and spiritual quality in simple forms, even in the figure of a warrior. Kofun tumuli’s spread from the Kinki region, then the political center of Japan, to outer areas throughout the country indicates the establishment of the Yamato (ancient name of Japan) government and the lineage of the Imperial House that still continues today. Shintō, the other major religions of Japan, was closely tied to the empowerment of Japanese Emperors, believed to be the descendants of the sun goddess Amaterasu. Literally meaning “the Way of Gods,” Shintō is a polytheistic faith with a wide array of spirits that embody natural objects and phenomena, as well as inanimate things. Such an animistic world view still strongly preoccupies the cultural life of Japan today: one example is the unique tradition of harikuyō (“memorial for broken needles”), born out of the Shintōist respect for mundane everyday objects. One may also recognize similar sensitivity behind Sony’s invention and exploration of the robot dog, Aibo, as a companion animal. Of over 80,000 Shintō shrines that currently exist in Japan, the most important is the Ise Shrine in Mie Prefecture, the foundation of which can be dated as early as 4 BCE in the Yayoi period. Ise Shrine collectively refers to numerous Shintō structures in the area, bilaterally grouped as naikū (the Inner Shrine) consecrated to the sun goddess Amaterasu, and gekū (the Outer Shrine) devoted to the grain god who prepares food for her. A visitor to the Inner Shrine passes under the torii gate and crosses the bridge, both of which mark the transition into a sacred domain, and then proceeds to worship Amaterasu at the Main Hall (honden), protected in the innermost sanctuary and only partially visible behind wood fences. In a unique ritual known as shikinen sengū (“ceremonial year shrine transfer,” or “the moving of the goddess”), the Main Hall is rebuilt anew every twenty years at an adjacent identical rectangular lot within the sanctuary. This practice is believed to have begun in 690 CE, and except for occasional delays and the 120-year-long disruption due to civil wars in the late fifteenth to sixteenth century, has been continued to this day with the most recent occurrence in October 2013. The architectural style and technique of ancient Japan, including the selection and preparation of materials, thus has been preserved through rituals, not in the physical originality of the building. The Main Hall’s unchanged style, specifically known as shinmei zukuri, is characterized by a gabled roof supported by main pillars on its short sides, an entrance on one of the long sides, and a raised floor and veranda surrounding the building, believed to have evolved from raised-floor granaries. The end of the Kofun period is marked by the official introduction of Mahāyāna Buddhism to Japan in 538 or 552 CE (recently the former date is more supported in Japan, but most art history surveys in English list the latter date), made through gifts of the Buddhist scriptures and a gilt bronze statue from King Seong-wang of Baekje (one of the Korean Three Kingdoms) to Emperor Kinmei. The subsequent Asuka, Hakuhō, and Nara periods (538/552-645-710-794 CE) are separated by major political incidents, but are related by the centralization of Buddhism in Japan’s politics and society. The assimilation of Buddhism also promoted direct exchanges with China and further absorption of continental art, culture, and philosophies. The Buddhist artifacts and monuments created in this phase, still extant in Japan, are important records of early Buddhist art and architecture of all of East Asia. Most Chinese and Korean artifacts and monuments did not survive due to the major Buddhist persecutions in China between the fifth and the tenth centuries, and the predominance of Confucianism in Korea under the Joseon dynasty (1392–1910). The introduction of a new foreign religion brought confusion to the Yamato court in the mid-sixth century. The civil conflicts between two powerful aristocratic clans, the pro-Buddhist Sogas and the anti-Buddhist Mononobes, ended with the latter’s defeat, and the proclamation of the reconciliation and amalgamation of Shintōism and Buddhism (shinbutsu shūgō) by Prince Shōtoku (572–622 CE). The son of Emperor Yōmei, and later a regent of his aunt Empress Suiko, Prince Shōtoku was a semi-legendary politician and Buddhist scholar, who had become himself the object of worship as the founder of Japan’s first Buddhist monasteries, derived from his research on Chinese and Korean precedents through treatises and illustrations. One of his achievements, the Hōryū-ji temple complex, located outside Nara is the world oldest extant wood architecture, originally constructed in 607 CE. The present structures are reconstructions completed in c. 711 CE after a fire in 670 CE. The current plan (garan) of Hōryū-ji is asymmetric, as the Middle Gate (chūmon), Five-Story Pagoda, and the Golden Hall (kondō) are arranged slightly off the north-south axis, while the lost original plan is believed to have followed the more orthodox Chinese and Korean style, strictly symmetrical and centered around the Pagoda. This change in layout suggests 1. the increasing significance of the Golden Hall (the main worship hall housing the statue of Buddha), rivaling the previously most important pagoda (the reliquary, or the container for Buddha’s ashes, developed from Indian stupas into vertical structures in China; considered to be the embodiment of the Buddhist doctrine); 2. the Japanese preference for asymmetry, also echoing the asymmetric balance of the pagoda and the Golden Hall. Comparing the Chinese-influenced Hōryū-ji Golden Hall to the domestic architectural style of the Ise Shrine Main Hall can be a good exercise for detecting the foreign elements newly introduced to Japan: the raised-floor is replaced by a stone platform, and the reed-covered gabled roof is taken over by the double-roofed hip-and-gable style fortified with clay tiles. Although the Golden Hall appears to be a two-story building from the outside, its interior consists only of one story, unlike its Chinese model. The Golden Hall’s interior is presided by a gilt bronze Shaka Triad, a Shakyamuni (historical) Buddha flanked by two attendant bodhisattvas, created by Tori Busshi, a master craftsman of Korean decent. This Buddha figural group, shown with the “fearlessness” mudra (hand gesture) to symbolize their benevolence, was commissioned in 623 CE as an offering to Prince Shōtoku who had died in the previous year. This object is believed to have survived the 670 fire. The style shows Tori’s familiarity with the continental style of Buddhist sculpture: the frontal pose, flat bodies, slightly enlarged heads with archaic smile, and flowing linear drapery bear a strong resemblance to the Buddhist sculptures created in Northern Wei China or contemporary Korea. The wall paintings that originally adorned the interior of the Golden Hall were destroyed in a fire in 1949, but photographic evidence suggests that their style was influenced by early Indian paintings, such as the ones at the Ajanta cave temples. Hōryū-ji has other examples of early Japanese Buddhist painting that possibly show the similar international style of the lost Golden Hall wall painting. The base of Tamamushi Shrine, a miniature replica of the destroyed original Golden Hall, is decorated with panel paintings. Two of these paintings illustrate episodes from the Jātaka Tales, a body of literature on the former lives of Shakyamuni Buddha (Gautama Siddhartha), largely derived from folklore and established in India around the fourth century BCE. Hungry Tigress illustrates Buddha’s encounter in one such reincarnation with a starving tigress, who was on the verge of killing her two cubs out of despair. Even though Buddha compassionately offers his own body to feed the animals, they were too weak to kill him, so he jumps off a cliff to wrench his flesh. The anonymous artist of Hungry Tigress depicted the scene in a continuous narrative, by repeating the slim, elegant figure of Buddha three times in the single pictorial space: he first appears on the cliff top as he takes off his cloth, then is vertically diving in the air, and lastly lies horizontally as his body is devoured by the tigers. Following the sequence of Buddha’s movements from top to bottom, the viewer’s eye traces a large inverted C-shaped curve, which echoes multiple decorative C shapes in the stylized depiction of rugged cliffs on the left edge of the painting. The graceful rhythm created by abstract forms and flowing lines contrasts to the staggering brutality in the story, but paradoxically sublimates Buddha’s deed as the ultimate form of self-sacrifice. On the continent, the Silk Road trade route reached its height in the eighth century, and the flourishing of international trade from Asia to Europe also impacted various aspects of Japanese society in the Hakuhō-Nara period. As the newly built capital of Heijō-kyō (today’s Nara) was entirely modeled after the Chinese grid urban plan, Tang dynasty China remained the most direct and all-encompassing influence on the political, economic, and cultural system of Japan. However, the wider cultural influence well beyond the border of East Asia also reached Japan at this time, as evidenced by the objects diversely originated from India, Persia, Egypt and Rome still in the imperial collection of the Shōsō-in treasure house at the Tōdai-ji temple. Yakushi Triad, a Medicine Buddha flanked by Nikkō (Sun Light) and Gakkō (Moon light) bodhisattvas, a sculpture in the Golden Hall of the Yakushi-ji temple, is one embodiment of the rich internationalism of the time. Students can recognize the Greek origin of contrapposto in the figures of the two bodhisattvas, and are also able to trace the transmission of this pose via the Silk Road through the Greco-Indian Gandhara Buddha image, and the Tang dynasty Buddha group at the Longmen cave that they must have studied in the lectures on South Asian and Chinese art. The body of the Medicine Buddha, cross-legged on falling drapery, is full and robust, revealing the Japanese’s quick departure from the Chinese/Korean-influenced frontal and linear style found in the Shaka Triad just a few decades ago. This new tendency towards a fully rounded body with greater anatomical definition certainly paralleled the Tang dynasty style, most visible in the Longmen Vairocana Buddha, which in turn had been influenced by fleshy Indian Buddhas of the Gupta or Mathura period. By the end of the eighth century, the capital of Heijō-kyō was packed with numerous Buddhist temples that were problematically gaining political leverage. In 794 CE, Emperor Kanmu finally moved the capital to Heian-kyō (today’s Kyoto) in order to break free from this corruption, marking the beginning of the Heian period (794–1185/1192 CE). This was a time when actual political control was transferred from emperors to the powerful aristocratic Fujiwara family, who also established refined elegance and sumptuousness as the dominant style of Heian art and culture. The Heian period also saw changes in Japan’s relationship with China. In the early Heian period, China, still under the prosperous Tang dynasty, continued serving as Japan’s model, but after the fall of the Tang empire (907 CE), the Japanese stopped sending official emissaries to the continent and the Chinese influence quickly diminished. This distance from China in the middle to late Heian phase propelled the burgeoning of unique, national style in art and literature for the first time in Japanese history, such as the development of the new pictorial genre of emaki narrative scrolls. Also of particular interest here is the Japanese self-identification as “feminine,” as opposed to the “masculine” Chinese models: we repeatedly encounter with such binary distinction of “masculine” vs. “feminine” in Heian art, the implication of which would shift in the late Heian/Kamakura period. In visual art, in addition to the inherently foreign-influenced Buddhist subjects, Heian painters increasingly favored the depictions of the local landscape in four seasons and subjects derived from domestic literature. This type of painting came to be recognized as yamato-e (Japanese painting), as the counterpart to the Chinese-inspired kara-e (Tang painting). In literature, Japanese developed new phonographic letters known as kana, abstracted from a set of kanji (Chinese characters) that had been introduced to the country by the end of the Yayoi period. While official documents and Buddhist texts were still strictly written in kanji, gendered as otoko-de (masculine writing), the usage of kana, or on’na-de (feminine writing), became prominent in personal and intimate literature such as journals, letters, and the 31-syllable verse known as waka (Japanese poems). The rise of female writers in medieval Japan’s literary scene is a unique phenomenon in human history, and may not have been unrelated to the “feminine” identification (regardless of the author’s actual gender) of the national writing style. The Tale of Genji, arguably the oldest novel in the world, was written by Lady Murasaki, a lady-in-waiting possibly related to the Fujiwara family, and completed by c. 1008 CE. Intended for female readers at the court, the Tale of Genji narrates the fictive lives of Prince Genji and his descendants on an epic scale, equivalent to a 2000-page long modern novel. Its narrative focuses on romantic encounters of Genji, but also communicates existential ebbs and flows with great attention to subtle emotions of characters, addressing the newly emerged unique Japanese aesthetics that embraces evanescence and transience. The long-standing popularity of the Tale made it one of the most illustrated narratives in the history of Japanese painting. One of the most celebrated examples, the national-treasured Tale of Genji Scrolls come from Heian period, originally a complete set of all 54 chapters rendered on handscrolls, only a handful of which have survived to this day. The production of this lavish set is believed to have been a collective work, involving a calligrapher, a main painter who determined compositions and painted the initial contours, colorists who finished the images outlined by the main painter, and others who were in charge of the paper decorations and mounting of the scrolls. While the set’s provenance is unclear, the sheer scale of the work suggests that it was completed at a national scale, intended for a royal or aristocratic audience. Each scroll typically consists of two or three pairs of a text alternating with illustrations. Thus, when looking at an image, the viewer is already familiar with the event going on in the scene. A Scene from the Kashiwagi Chapter, the thirty-sixth in the entire tale depicting Genji in his late forties, narrates an episode in which the Third Princess, one of Genji’s consorts, confesses her adultery and her decision to become a nun due to her guilt. The image shows Genji delicately holding the Third Princess’s baby and her lover Kashiwagi. Kashiwagi was the best friend of Genji’s oldest son, but recently died due to his sinful agony, thus the scene tangibly depicts Genji’s sorrow over Kashiwagi’s death and Princess’s departure as well as his benevolence in accepting the now fatherless baby as his own son. Yet another theme that runs through this episode is that of the poetic justice, or the Buddhist concept of the “retribution of Karma”: as the reader is introduced in earlier chapters, Genji himself has an illegitimate son who goes by as his half-brother, born out of his dangerous liaison with his late stepmother, the youngest concubine of his late emperor-father. In the painting, the face of Genji is rendered in the simplified generic hikime kagihana (“a line for the eye, a hook for the nose”) style, and the dramatic emotions are instead conveyed through the multi-layered rich colors, known as tsukuri-e (“constructed painting”). The rich colors are also a distinctive feature of on’na-e, the “feminine painting.” In order to make the indoor scenes visible to the viewer, the artist devised the hikinuki yatai (“blown-off roofs”) technique, in which the ceilings and roofs of buildings are omitted from the bird’s eye view. While grasping the elegance of the Heian court life in the intricate details of garments, screens and fabrics, the artist also explored the destabilizing effects of the diagonal, asymmetric composition that pushes the figures to one corner. As opposed to the “feminine painting,” distinguished by rich colors and epitomized in The Tale of Genji Scrolls, otoko-e or “masculine painting” was characterized by the emphasis on brushwork, largely indebted to the ink monochrome tradition of Chinese painting. One of the masterpieces of this masculine style is Frolicking of Animals, a set of four handscrolls belonging to the Kōzan-ji temple in Kyoto, and once attributed to the hand of a monk Toba Sōjō (this attribution is now in question due to the various styles recognizable in different volumes). Unlike most other emaki scrolls, Frolicking of Animals is not accompanied by texts but only consists of black-and-white paintings. Even though there seems to be certain narrative themes ask your students to take a look at the first volume before class and to interpret what they see for homework. The most celebrated first volume depicts anthropomorphized rabbits, frogs, and monkeys engaging in amusing activities that can be interpreted as caricatures of human life and society. The artist’s mastery of brush technique, unmistakable in the brisk and confident brushstrokes, simultaneously captures the essence of animal forms and transforms them into humorous humanized actions. This volume is often considered the origin of Japanese manga due to the use of abstract lines to indicate movement and sounds, a technique commonly used in modern manga. Students can also see that the artist worked directly on the paper without any under-drawings nor mistakes, as typical of East Asian painting tradition. In the last phase of the Heian period, Japan entered a chapter of political turmoil when the emerging military clans known as samurai overtook the weakening aristocratic. The transition to the Kamakura period (1185/1192–1333 CE) was marked by the Genpei Civil Wars (1180–5 CE), a series of battles fought between the two powerful samurai clans, the Minamotos and the Tairas, which ended with the triumph of the former and the complete destruction of the latter. Minamoto no Yoritomo (1147–99 CE) became the first shōgun in Japanese history, the de facto governor of the country. The political influence of the Emperors was reduced to the appointment of shōguns as their regents until the end of the Edo period. The capital was also for the first time moved to eastern Japan in the city of Kamakura about a hundred miles to the south of today’s Tokyo, where the new artistic taste, reflecting the samurai aesthetics and lifestyle, emerged. Rejecting the graceful and sumptuous Heian court style, Kamukura warriors favored simple and pragmatic, virile and robust qualities This shift in artistic orientation can be recognized in the emaki handscrolls of this period as well. The Tale of Heiji Scrolls (second half of the thirteenth century CE), created about a hundred years after the Genpei Civil Wars, chronicles the major events of the legendary military conflicts with a vigorous sense of realism, combining the vivid colors of “feminine” (Tale of Genji Scrolls), and the dynamic actions and brushwork of “masculine” (Frolicking of Animals). Although the Tale of Heiji Scrolls themselves are considered “masculine painting,” this categorization did not result from their visual reliance on the Chinese style, but rather stemmed from the “masculine” military subject, giving rise to the “battle painting” narrative sub-genre. Unlike the Tale of Genji Scrolls that break up one chapter into multiple scenes, each volume of the Tale of Heiji Scrolls begins and ends with substantial text parts, and emphasizes an uninterrupted visual representation in the central portion of the scroll. Night Attack on Sanjō Palace depicts the kidnapping of the ex-Emperor Shirakawa by the Minamoto warriors and their noble ally Fujiwara no Nobuyori, opening with the chaotic procession of the nobles on ox carts, surrounded by warriors on horseback. While deploying conventional bird’s eye perspective, the anonymous painter of the Heiji Scrolls introduced a new technique to divide the foreground and the background of one pictorial space into different scenes, enabling a seamless visual narrative clearly indicative of spatial and temporal progress. This is most obvious in the middle in which one sees Fujiwara no Nobuyori holding a bow and arrows, ordering the Minamoto troop in the background to attack the palace. In the foreground, court ladies can be seen mourning. The contrast between masculine power and female passivity continues as one witnesses further violence to the left side of this scene, culminating in the dramatic depiction of the burning palace behind the fighting warriors. Because of the meticulously rendered details, the Night Attack volume is also an important visual record of the weapons and armors worn by the samurais of the Kamakura period. Detail of Night Attack on Sanjō Palace, from The Tale of Heiji Scrolls, second half of 13th c. CE, Kamakura period, handscroll, ink and color on paper, 45.9 x 774.5 cm. In addition to pictorial style and perspective, have students consider the different narrative techniques deployed and explored by these artists, by examining temporal and spatial relations between various scenes and figures in the works. the actual experience of “reading” the stories; how is the viewer’s eye led, and how long does it take to go through the imagery? Ikuyo Nakagawa (author) is a PhD Candidate at the CUNY Graduate Center. Her dissertation examines all aspects of the career of Japanese-born painter Tsuguharu Foujita in the international context of the historical avant-garde.